Boston, August 10, 2016, — Gov. Charlie Baker today signed comprehensive economic development legislation into law, providing up to $1 billion in new investments in communities, workforce training, and innovation across Massachusetts, and deepening the state’s economic competitiveness. The new economic development law, An Act Relative to Job Creation and Workforce Development (H. 4569), advances job creation by expanding the Baker-Polito Administration’s commitment to building a skilled workforce and connecting residents to economic opportunities, strengthening community and housing development efforts, and investing in the emerging technologies that will underpin the Commonwealth’s economic future. An Act Relative to Job Creation and Workforce Development provides new capital funding for local infrastructure, Brownfields site cleanup, Gateway Cities development, site assembly and site readiness, workforce development, emerging technologies, and community-based innovation. 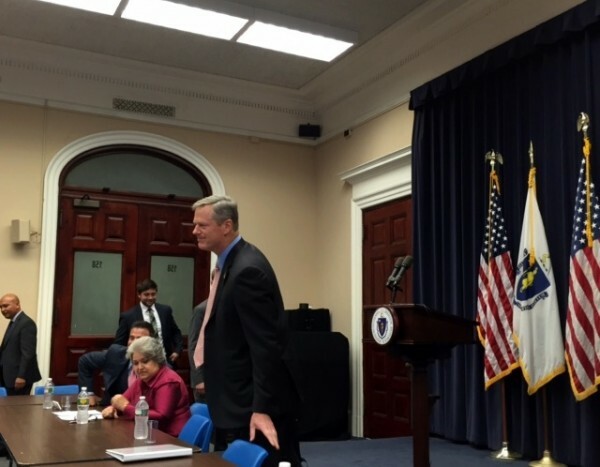 The legislation also reforms the state’s smart growth housing toolbox, streamlines the state’s Economic Development Incentive Program, and allows for the expansion of Boston’s Conley cargo terminal. And it updates obsolete liquor laws, ensuring that Massachusetts farmer-wineries will continue to be able to sell their products on their own premises. MassWorks ($500 million capital authorization): Reauthorizes a capital grant program that provides municipalities and other public entities with public infrastructure grants to support economic development and job creation. Transformative Development Initiative ($45 million capital authorization): Supports the revitalization of Gateway Cities, by enabling MassDevelopment to make long-term patient equity investments in key properties in Transformative Development Initiative districts, with the goal of accelerating the maturation of private real estate markets. Brownfields Redevelopment Fund ($45 million capital authorization): Moves funding for the state’s Brownfields Redevelopment Fund to the capital program, providing a reliable long-term funding stream for a fund that is the Commonwealth’s primary tool for facilitating the redevelopment of contaminated properties. Site Readiness Fund ($15 million capital authorization):Advances regional job creation by creating a new fund for site assembly and pre-development activities that support regionally significant commercial or industrial development opportunities. Massachusetts Food Trust Program ($6.4 million capital authorization): Capitalizes a financing program to support rural agriculture and increase food security in low- and moderate-income communities. Smart Growth Housing Trust Fund ($15 million capital authorization): Moves funding for the state’s Smart Growth Housing Trust Fund to the capital program, providing a reliable long-term funding stream for a fund that is the Commonwealth’s primary tool for facilitating smart growth housing development. Starter Home Zoning: Incentivizes the creation of smaller, denser, and more affordable single-family homes by creating a new starter home option under the Chapter 40R smart growth housing program. Housing-Related Tax Increment Financing: Supports housing production in town centers and urban neighborhoods by reforming a seldom-used local-only smart growth tax incentive program, removing onerous regulations, and allowing communities to set their own affordability requirements. Housing Development Incentive Program (HDIP) Reform:Supports the development of market-rate housing in Gateway Cities by allowing credits to support new construction, and by raising the formula that sets housing development incentives. Workforce Skills Capital Grants ($45 million capital authorization): Establishes a new grant program for workforce development training equipment, to strengthen workforce skills, and create strong employment pipelines. Massachusetts Manufacturing Innovation Initiative (M2I2) ($71 million capital authorization): Provides matching grants to establish public-private applied research institutes around emerging manufacturing technologies. The state’s capital funds will be matched with federal and private industry funds. Scientific and Technology Research and Development Matching Grant Fund ($15 million capital authorization): Reauthorizes a capital grant program that funds nonprofit, university-led research collaboratives working to commercialize emerging technologies, thereby supporting the development of emerging industry clusters. Community Innovation Infrastructure Fund ($15 million capital authorization): Creates a new fund for making capital grants that support community-based innovation efforts, including co-working spaces, venture centers, maker spaces and artist spaces. Digital Health Care Cluster Development: Broadens the statutory charge of the Massachusetts eHealth Institute (MeHI) to include digital health cluster development. Angel Investor Tax Credit: Promotes startup activity and job creation in the Gateway Cities, by incentivizing investment in early-stage life sciences and digital health firms. Conley Terminal Rehabilitation ($109.5 million capital authorization): Permits the Massachusetts Port Authority to pursue the reconstruction of South Boston’s Conley Terminal, including berth construction and crane procurement, to accommodate new, larger cargo ships. College Savings Tax Deduction: Provides Massachusetts residents with tax deductions for making deposits into prepaid tuition or college savings accounts. Economic Development Incentive Program (EDIP) Reforms:Builds accountability in the state’s primary job-creation incentive program by strengthening the link between the issuance of tax credits, and job creation that would not otherwise occur; adds flexibility to the incentive program by eliminating obsolete, formula-driven incentive categories. Liquor Law Reforms: Protects the ability of farmer-wineries, farmer-breweries, and farmer-distilleries to serve their products on their own premises; supports consumer choice and access to markets by allowing retailers who sell alcohol to also serve alcohol in in-house cafés; liberalizes restrictions on the sale of alcohol around certain holidays. Regional Economic Development Organization (REDO) Modifications: Shifts the focus of nonprofit regional economic development nonprofits toward systems-based efforts to stimulate economic growth, including strengthening the regional skills pipeline, and executing regional industry cluster development strategies. Fantasy Sports: Legalizes daily fantasy sports contests operated in accordance with regulations promulgated by the Attorney General.